A witch hazel mouth rinse (again, don’t use witch hazel that contains isopropyl alcohol) can help to reduce pain and swelling of irritated or infected gums. Witch hazel can be used stop minor bleeding of the gums and mouth. The same treatment may also be used to soothe pain caused by emerging wisdom teeth or after oral surgery to reduce discomfort and inflammation. 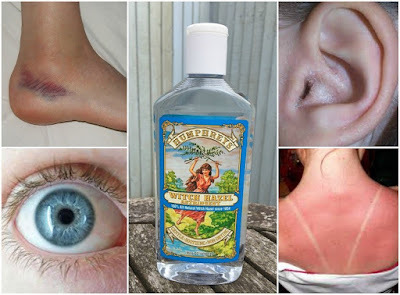 Mix some witch hazel in with your Aloe Vera gel the next time you need to treat a sunburn. The anti-inflammatory power of this incredible plant extract will aid your skin in healing while it and the Aloe help to cool the burn. This treatment can also help to prevent skin from peeling in the days following a bad sunburn. Just as witch hazel can be used to ease pain and itching from poison ivy and its cousins, the same works for bug bites and stings. Yet another reason to carry a bottle of this awesome remedy with you the next time you plan to spend a day outdoors. Making your own witch hazel is surprisingly easy. Pour enough distilled water into the pot to cover the witch hazel. Turn down the heat and simmer for twenty minutes. Take the pot off the heat and leave it covered until completely cooled. Add half the amount of pure grain alcohol to the witch hazel tea. Store this mixture in a cool place for up to 2 years.